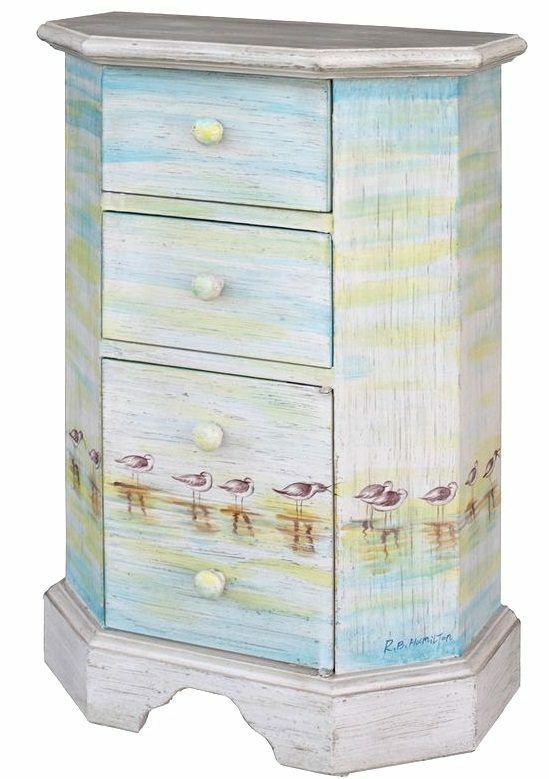 Enjoy a serene beach scene, beautiful sea life or a sentiment with art furniture. 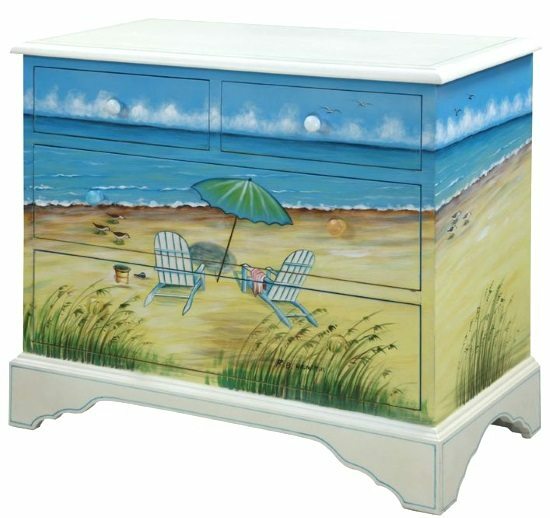 Painted dressers and chests by Gail’s Accents, Coast to Coast Imports and Pulaski Furniture are available through a variety of online retailers. The Shoreline Adirondack Chest and the following two pieces are from Gail’s Accent Shoreline Collection via Home Gallery Stores. The collection transferred paintings by North Carolina artists Richard B. Hamilton and Betsy Drake to dressers, chests, as well as end tables and other home furnishings. 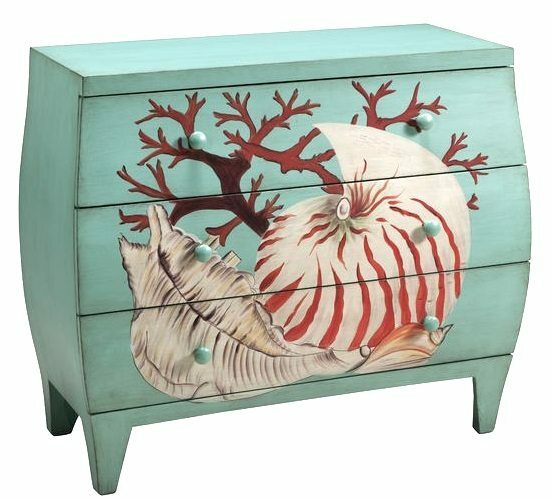 The fabulously painted Sea Life and Shell Chest is from the Coast to Coast Imports Furniture Collection. Currently on sale with an extra 10% off at Bellacor. Offer Ends 09/08/2014. 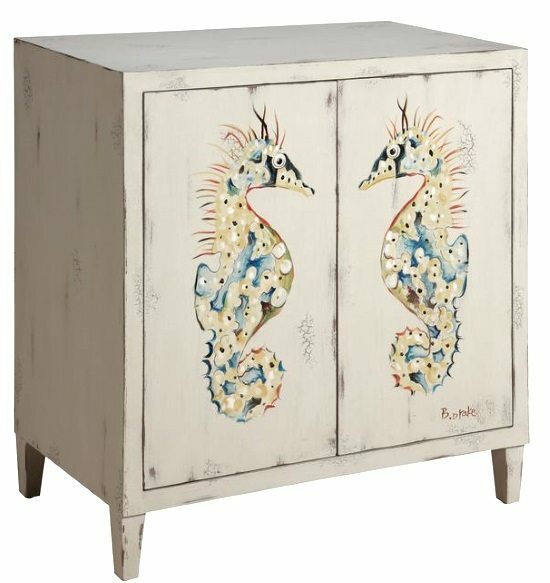 This cool Shell and Sand Accent Chest is made by Pulaski furniture. If you love it, this is the time to grab it. All Pulaski furniture pieces at Home Gallery Stores are 15% off through September 8th -use code LD15. 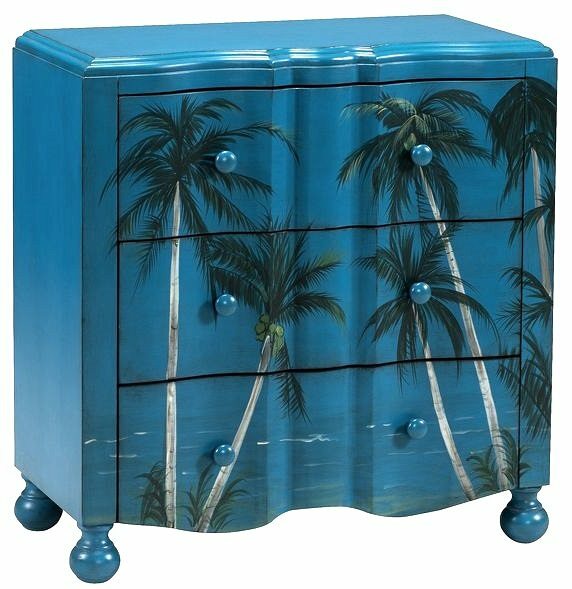 If you dream of palmy breezes (which I always do), then this Palm Tree Chest might just be the cure for your longings. Made by Coast to Coast Imports. Also currently on sale with an extra 10% off at Bellacor. Offer Ends 09/08/2014. 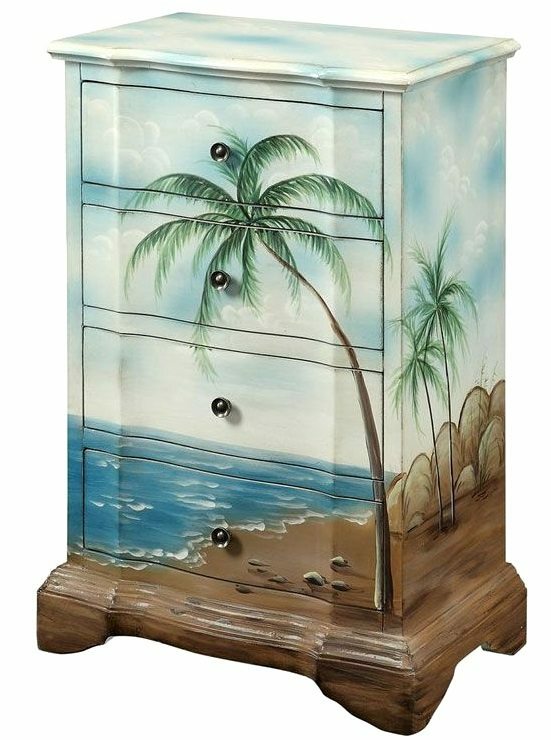 Or how about this lovely palmy beach art scene on their Tropical Cabinet! I discovered this piece on sale at The Furniture Warehouse -the sale price is almost to good to be true. I love when art meets function and I’m really into the beachy palm tree scenes and the gorgeous sea life. 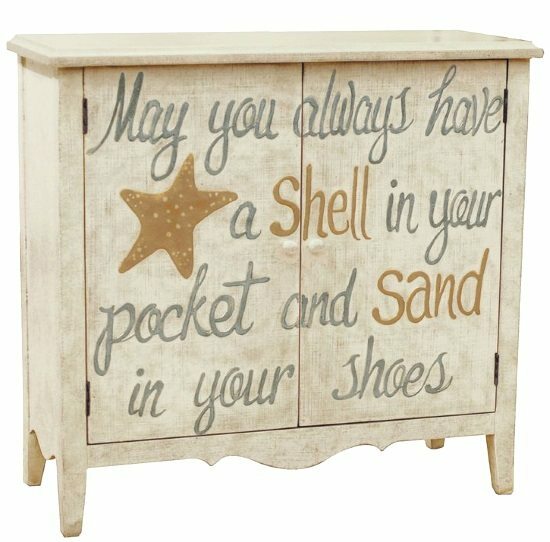 Goes without saying that I adore the dresser with the Beach Quote! 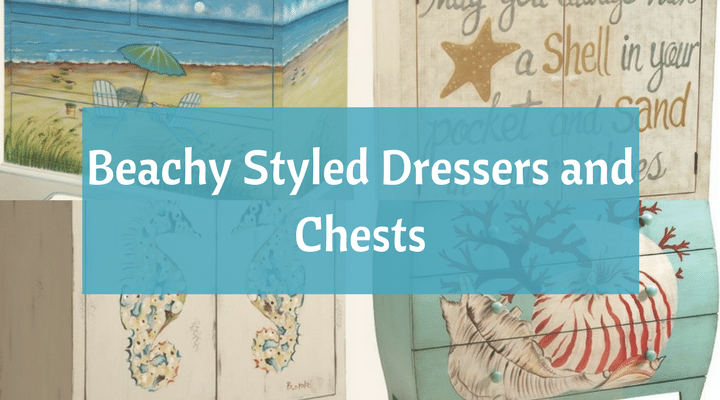 If you love the idea of beach art furniture, but prefer a one of a kind piece, you could always commission an artist in your area to paint a dresser or chest that you already have. Just another idea. Or, of course, paint it yourself if you have the talent and the time.